A young mother appeared in front of a nairobi court to answer charges of murder after she allegedly stabbed her employee who asked for her dues after working. Claire Kasaya also known as Mitchelle is said to have stabbed Anne Wangari Karumba on her neck in Kamala slums in Donholm estate when she asked for Sh 100 from her as wages. The 24 year old Kasaya contracted the deceased to do her laundry for her that day and realised later that Sh 270 that she had in the house was missing. Clair confronted Karumba to ask for it but she said that she is not the one who took it. Instead, she asked for her dues for the day but Kasaya refused. She drew a knife and threatened to kill her if she did not pay up. It was during that scuffle that the 35 year old was overpowered and stabbed to death. 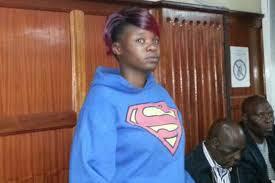 The accused has been remanded at the Langata Women’s Prison until December 22, 2015, when she will take a plea.